Camp Civitan is seeking paid staff for its upcoming summer program for youth and adults with special needs (submitted photo). At nearly 7,000 feet, the historic mountain town of Williams, Ariz. is an enticing destination during the hot summer months. For high school graduates and college students, it may also be the best job location they will ever have. Located near Williams is a summer camp for children and adults with special needs. Founded in 1968, Camp Civitan was one of the first stay-over camps for people with all abilities in the country. Today, the camp is recognized nationally for its services and programs for the disabled. The summer camp offers 10-weeklong sessions where campers experience a variety of enriching and fun experiences that promote positive self-esteem, teamwork, socialization and healthy activities. Each weeklong camp session, starting May 30 through Aug. 5, offers special needs campers, some as young as 8 and as old as 65, the opportunity to make new friends, sing, dance, create art projects, do theatrical skits, fish and visit area attractions. Many of the trips include the Grand Canyon, Bearizona, area lakes and other destinations. Campers and staff, as well, gain many new life skills that include self-confidence and independence. Camp staff positions are paid, on average, for the entire 10-week summer sessions over $5,000, including all meals and lodging. Camp Civitan encourages teens, ages 13-17, to volunteer. Not only will the experience offer community service hours and resume reference, but teens will share their talents and skills, learn activity planning, develop leadership skills and make life-long memories and friends, as well. Volunteers spend a full week at camp, which includes food and dorm accommodations. Assignments include kitchen duty, organizing sporting activities and assisting camp staff with members. 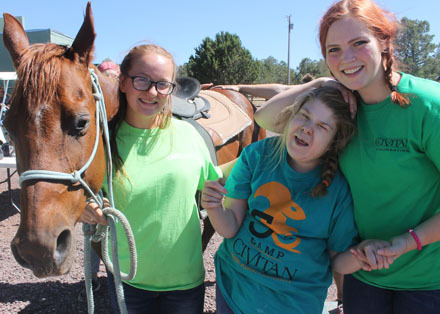 To learn more and to apply for Camp Civitan staff positions and volunteer opportunities, go to www.civitanfoundationaz.org/camp-civitan or call 602-953-2944. Camp staff must be a high school graduate or GED, at least 18 years of age. Volunteers must be 13 to 17 years of age.